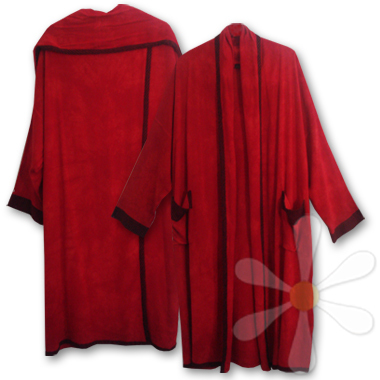 MOROCCAN SOUSDE PANELED DESERT GODDESS DUSTER IN RED CRYSTAL DYE! I am SO excited to introduce the ESSAOUIRA -- pronounced 'ess-ah-wire-ah' -- named for the windswept beach town on the Atlantic coast of Morocco. It's at once luxurious and breezy-casual, can be worn to the opera or for a sunset walk at the coast: if I were naming it for California I'd call it the 'Mendicino'! Divinely delicious, the long fluid drape is authentically ethnic, created from two panels that overlap in the back, bordered in dyed-to-match stripes. Deep front pockets are always welcome! It's a truly versatile must-have for your unique wardrobe, and it layers brilliantly with so many of our styles... Express your inner diva with PIZZAZZ!